At it’s best, The Office is an ensemble comedy – and what I liked best about last night’s episode “Trivia” was that it took advantage of what a great cast this show still has, post-Carell. The plot for the episode was simple, but hilarious: In order to hit Robert California’s high sales expectations by the end of the quarter, Andy had been buying paper himself. But it was the last day, and although they were only a little over $800 shy of hitting the goal, Andy was out of money. So he followed Oscar to a trivia championship at a gay bar in Philly, where the prize was $1000. 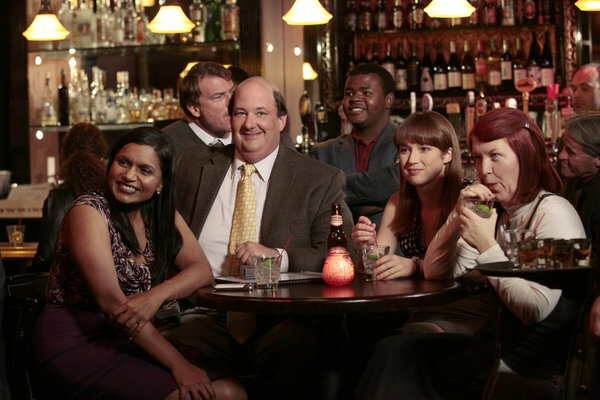 First, I loved how easily the employees were divided into three groups – an A Team (Andy, Jim, Darryl and, before he left to be with his smartphone, Ryan), a B Team (Phyllis, Stanley, Pam’s replacement and Creed), and a team to just have fun (Kevin, Meredith, Kelly and Erin). It was a little predictable that the random knowledge (thanks to watching a lot of Khloe and Lamar, knowing in which films Marion Cotillard appears naked, and being overweight) provided by dumbest team, but you’ll get no complaints from me. It was hilarious. Less hilarious was Dwight’s trip down to Florida to meet with Robert about a management position. Nothing about this storyline felt fresh or funny, from Gabe’s role in the company to Dwight’s intense, ridiculous behavior. It felt like this was supposed to be a major development for Dwight’s character and his relationship with Robert, but nothing happened. And we knew nothing would happen, because there’s no way the show would move such an important character to Florida. All in all, I thought it was an inconsistent episode – I liked the trivia storyline, but the Dwight stuff really fell flat for me. What did you guys think?